Size:set oz. Give us a shot and we will make sure that you will look to us again! No sulfates and parabens system. You're already purchasing the item. Item model number. Learn More. Matrix Total Results Brass Off Custom Neutralization Mask 6.8oz - NEW & FRESH! 5 out of 5 stars - Matrix Total Results Brass Off Custom Neutralization Mask 6.8oz - NEW & FRESH! 3 product ratings3 product ratings - Matrix Total Results Brass Off Custom Neutralization Mask 6.8oz - NEW & FRESH! Matrix Total Results Mega Sleek Shampoo & Conditioner Set Duo Brand New and 100% Authentic! Set Includes: * Matrix Total Results Mega Sleek Shampoo - 33.8 fl oz / 1 Liter * Matrix Total Results Mega Sleek Conditioner - 33.8 fl oz / 1 Liter *NOTE: These items will be shipped in a padded envelope. Please select the Medium Flat Rate Box option if you would like it to be shipped in a box. Buy 2 or more and it will automatically be shipped in a box. Please ask any questions before purchasing. Thanks for looking! Sleek Look Shampoo 13.5 oz. Sleek Look Conditioner 13.5 oz. Matrix Biolage Pro-Keratin Silk Shampoo & Conditioner Duo, 33.8 oz each. No sulfates and parabens system. Product Details. Matrix Total Results Mega Sleek Shampoo & Conditioner Liter Set Duo, 33.8 Oz. Direction: Shampoo: Apply to damp hair. 5 out of 5 stars - Matrix Total Results Mega Sleek Shampoo & Conditioner Liter Set Duo, 33.8 Oz. 8 product ratings8 product ratings - Matrix Total Results Mega Sleek Shampoo & Conditioner Liter Set Duo, 33.8 Oz. Trending at $37.75eBay determines this price through a machine learned model of the product's sale prices within the last 90 days. 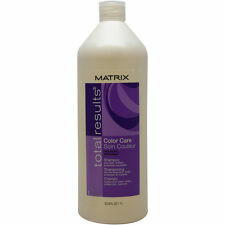 Matrix Biolage COLORLAST Shampoo 33.8 oz for color treated hair. MATRIX ESSENTIALS SLEEK LOOK SHAMPOO 13.5 OZ (Lot of 2). Condition is New. Shipped with USPS Priority Mail. Total Results Brass Off Shampoo neutralizes brassy tones while refreshing your hair with cool tones. Can be left on hair 2-3 minutes for added toning. Can be left on for 5-10 minutes for extra conditioning. 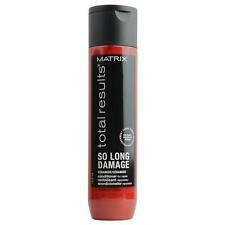 If you struggle with limp, lifeless hair, try Matrix Total Results High Amplify Shampoo. A silicone-free formula ensures that no heavy ingredients weigh your hair down and take away its natural lift, and natural protein builds hair up. Moisturizing mask for very dry coarse hair. 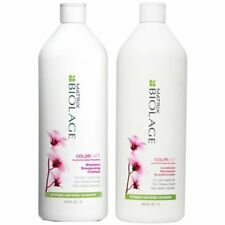 Matrix Biolage HydraSource Detangling Solution for Dry Hair 33.8 oz/1 Liter NEW! Quench your thirst for beautiful hair. Detangling Solution. 33.8 fl oz / 1000 ml. Apply to wet hair and leave in 1-3 minutes. Paraben-free formula is also suitable for color-treated hair. 5 out of 5 stars - Matrix Biolage HydraSource Detangling Solution for Dry Hair 33.8 oz/1 Liter NEW! 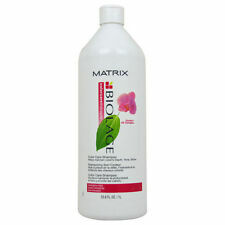 2 product ratings2 product ratings - Matrix Biolage HydraSource Detangling Solution for Dry Hair 33.8 oz/1 Liter NEW! Trending at $21.27eBay determines this price through a machine learned model of the product's sale prices within the last 90 days. EXQUISITE OIL. 16.9 OZ - 2 bottles. For Sale:1Matrix Biolage color care shampoo 16.9 oz &1Matrix Biolage Color Care Conditioner 16.9 oz. Biolage Color Care. Give her hair salon-vibrant color for up to 9 weeks . When using the system of COLORCARE Shampoo and Conditioner vs. a non-conditioning shampoo. This is a Liter Set of Matrix Biolage Full DensityThickening Hair Shampoo And Conditioner 33.8 oz each This set is for thin hair and is Paraben Free. Full Density Shampoo. Full Density Conditioner. Lightweight Conditioner to each hair strand, nourishing and fortifying hair for more body and shine. Color treated hair often needs special care to maintain its color and luster. Hair is left soft and detangled with extra shine and depth of color. Provides lightweight moisture, leaving hair feeling supple and nourished Suitable for color-treated hair Paraben Free. Frizzy hair is often difficult to manage in humid weather. Defends against humidity to keep your hair manageable and smooth. When using the system of HYDRASOURCE Shampoo, Conditioning Balm and Leave-In Tonic vs. This product was previously known as Biolage Hydratherapie Conditioning Balm. Conditioning Balm. 9.5 fl oz / 280 ml. For Sale:2Matrix Biolage Detangling Solution 16.9 oz. Inspired by the aloe plant that never seems to dry, Biolage. Apply to wet hair and leave in 1-3 minutes. Rinse thoroughly. Paraben-free formula is also suitable for color-treated hair. Matrix Total Results Repair Shampoo and Conditioner Duo 10.1 oz Free Shipping! Matrix Total Results Mega Sleek Shampoo and Conditioner Set 33.8 fl. oz.